But what would happen if there wasn't enough pipeline capacity to transport gas to markets to meet heating and electricity needs during winter? We already have the answers- very high natural gas prices that were up to 50x the average price. As shown below, natural gas prices at major hubs in New England, New York, and PJM spiked during the winter of 2013-2014 and the winter of 2014-2015. Independent System Operators (ISOs) in all the regions dispatched oil fired generating units to keep the lights on and control electricity prices as natural gas prices ranged between $60 and $120/MMBtu. It's true that the Polar Vortex events played a great role in creating those natural gas price spikes, but it was widely acknowledged by regional stakeholders that the lack of adequate pipeline capacity or pipeline constraints played a major role in increasing gas prices. It's also acknowledged that pipeline constraints in the nearby Marcellus region in Pennsylvania remained below $3.00/MMBtu during the same time. Many pipeline companies have responded to the regional constraints and price signals with new pipeline proposals. However, State agencies may be planning to deny Clean Water Act section 401 permits which would stop and or delay project construction. The Clean Water Act Section 401 permit is required before any federally approved project can be constructed. While not used often, the New York Department of Environmental Conservation's "Earth Day" denial of a section 401 permit for Williams' Constitution Pipeline that would move Marcellus gas to Massachusetts via New York, has thrown a wrench in the works. The final denial could ultimately stop the project. Extended regulatory delays can also adversely affect the viability of the project as well. Worse than that, other State agencies may also be contemplating denying permits to delay or scrap other pipeline projects. Environmental groups are encouraging the States to block pipelines, since they have not been able to thwart natural gas pipeline approvals by the Federal Energy Regulatory Commission (FERC). Some States and many environmental groups may reason that stopping pipeline projects is a means to discouraging fracking and gas drilling. Unfortunately that is simply not the case. Gas production is relatively high even in a low price environment. Instead, the high natural gas prices in past winters caused by pipeline constraints forced ISOs in the above regions to dispatch oil-fired power generating units to control electricity costs and maintain electric reliability. This was especially true for New England and New York where gas prices spiked the highest. In fact, ISO-New England's Winter Electric Reliability Program incentivized power generators to fill their tanks with fuel oil and be prepared to operate if natural gas prices spiked. Fortunately for New England rate payers the program was successful. The cost of no. 2 fuel oil was $22.71/MMBtu in the Winter 2013-2014 and fell to $11.87/MMBtu during the Winter 2014-2015. Last winter, it cost $6.80/MMBtu. So if today's natural gas prices increased to over $6.80/MMBtu for whatever reason there would be substantial calls for oil-fired and possible coal-fired power generation if it was available. Oil fired units use ultralight sulfur diesel fuel, no. 2 fuel oil and no. 6 fuel oil in increasing order of its polluting capacity. These fuels are much dirtier than natural gas. In the future, ISOs will dispatch oil-fired units when the price of fuel oil is lower than natural gas. This is called a Price Inversion Event. The frequency of price inversion events will generally increase as pipeline constraints become more pronounced. So in a sense denying section 401 permits for a natural gas pipeline is putting pressure on natural gas prices and increasing the frequency of of price inversion events. Not exactly good for the air we breath. Natural gas has been embraced by the power sector for reasons of abundance, low price, and a reliable interstate natural gas pipeline system. That could change drastically if the States routinely start denying section 401 permits or delay their issuance as they have routinely done in FERC's Hydropower Program. Such delays could thwart natural gas pipeline construction nationwide, and increase gas prices at certain times of the year. More important is how such delays be perceived by electric utilities and power generators. Would they perceive investments in gas-fired generation as risky because fuel could not be reliably delivered at an affordable price? In that scenario, electric utilities and merchant generators may reconsider coal as a fuel source and the risks relating to price, deliverability, and environmental factors. The current prices of natural gas and Appalachian coal is $2.07/MMBtu and $2.50/MMBtu, respectively, with a spread of $0.43/MMBtu without factoring in the cost of transporting the coal to the plant via rail or barge. Some of the gas-fired power projects being considered in New England and other regions have already been selected in capacity auctions conducted by the ISOs. The risk of increased pipeline constraints due to State section 401 permit denials may be vefry problematic for the power developers and the ISOs. Higher natural gas prices due to pipeline constraints would also make integrating renewables into the electric grid much more expensive, especially in regions that don't have pumped storage hydrpower or peaking plants to call on. Overall, implementation of the CPP could run into strong headwinds if State section 401 permits become common place and gas and pipeline transportation costs increase. The increased costs of the Clean Power Plan could be questioned and thwarted by considerable push back from residential and industrial electricity customers as well as electric utilities. Right now low natural gas prices offer a cost effective alternative to coal and half the carbon payload so environmentally speaking, it makes sense. Mitigating pipeline construction is not rocket science either. Both the pipeline industry and both federal and state agencies have decades of experience to draw on to protect environmental resources and the safety of communities persuant to section 401 of the Clean Water Act. The power sector has become more gassy and uses less coal to generate electricity. While horizontal driiling and multi stage fracking techniques are largely responsible for pentiful gas supplies, the shale revolutions would be fairly limited if it were not for the existing 305,000+ miles of pipelines authorized by FERC. 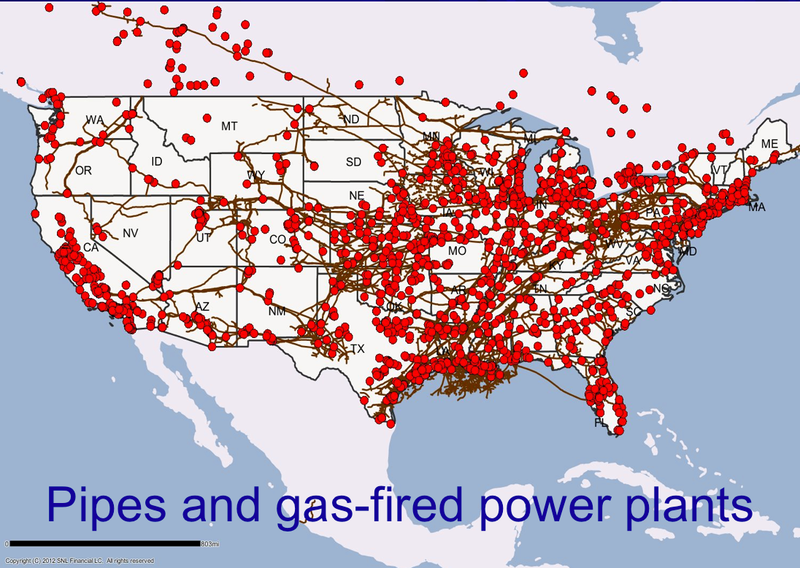 As shown below, over time gas-fired power generating plants have been built to take advantage of this extensive distribution system, which continues to grow and adapt to evolving needs. Natural gas pipeline companies have been routinely able to work out their differences with State agencies and formulate needed environmental mitigation to protect water quality and wetlands pursuant to section 401 permits. In fact, the denial of section 401 permit is the exception to the rule. In my opinion, both the New York Department of Environmental Conservation and Williams need to settle their differences and not be allowed to be pulled to the extremes by the environmental community or the pipeline industry. Litigation is not the answer at this point and can only result in extended delays and polarization. Shippers and purchasers who committed to use Constitution may opt out if there is no assurance that the pipeline can be completed on schedule. Also the thought of pitting the Clean Air Act, Natural Gas Act and Clean Water Act against each other in a higher court is very risky. Depending on how Constitution project turns out, Congress may have other ideas regarding the role of the States in siting pipelines and other linear infrastructure. Whether Congress intended to give veto power to one State when many States may be involved in a linear infrastructure project is an open question. The Constitution pipeline's section 401 permit denial can't be looked at in a vacuum either. Stakeholders in Pennsylvania (PA) and Massachusetts (MA) are also being affected both in terms of water quality and environmental quality and lower gas prices at the well head, because Marcellus gas can't get to market. Some key questions to answer is whether or not PA and MA have issued their 401 permits for the project. If they have, then what makes New York's environmental resources so different. Also will PA and MA retaliate in the future by denying section 401 permits that benefit only New Yorkers. This is indeed a possibility with numerous interstate natural gas pipelines and power plants being proposed throughout the U.S. I would hope that New York will look at the issue objectively and not only through the lens of what is good for itself, but for the other States and regions involved such as New England and the Mid-Atlantic. New York's Department of Environmental Conservation is no stranger to settlement agreements. In fact, the agency has an excellent record in working on large complex hydropower projects such as the 900-MW St. Lawrence-FDR Hydropower Project and the Niagara Project. I can personally attest to the NY Department of Environmental Conservation's professionalism during the settlement of the St. Lawrence-FDR project. Aggravating natural gas shortages and increasing gas prices overall that would be detrimental to CPP implementation. Higher costs for integrating solar and wind into the grid using gas-fired combustion turbines. Greater likelihood of natural gas price peaks in New England, New York and PJM during severe winter weather. Fuel switching to oil-fired power generation if natural gas prices exceed that of no. 2 fuel oil (energy equivalent of $6.80/MMBtu) and higher air pollution levels. Reconsideration by the Electric Sector on whether to burn coal or natural gas as the price spread narrow from its current $0.43/MMBtu in favor of gas. Major push back from the Electric Sector, States and rate payers of increased electricity rates and rising cost of integrating renewables into the grid. Cutting 53% or $221 billion from America's annual net bill for importing oil, gas and refined petroleum products. Displacing 200 million tons of coal consumed in the U.S. which is twice as polluting as natural gas. Reducing annual U.S. annual carbon dioxide emissions by 725 million metric tons, a world leading record. Banning use of the no. 6 and no. 4 fuel oils for water heating and space hearing large building in New York City by using natural gas and steam service. There are definitely negative aspects of relying on natural gas. Methane leaks are of concern and of course, drilling and fracking are messy activities that do disrupt communities. Noisy compressor stations on natural gas pipelines are also an issue. And yes, accidents like the recent natural gas pipeline explosion in PA do occur and unfortunately cause loss of life. These factors may be at the root cause of New York's denial of the section 401 permit for the Constitution pipeline and will undoubtably come up during settlement discussions, even though drilling and fracking are prohibited in New York. These are hard issues with no easy answers. I think that Gary Sernovitz, author of the book "The Green and the Black" summed it up best in the following paragraph which I have taken some liberty with. "Capturing the shale boom's benefits while sometimes sacrificing land and quiet of those communities [affected by drilling, fracking, pipeline accidents] might be the right thing to do for the country. It is not, however, fair." Disclosure: I wrote this article myself and it expresses my own opinions. I am not receiving compensation for it and have no positions in natural gas equities, physical natural gas or derivatives. Also I have no business relationship with any company, organization or project that is mentioned in this article.